Check out who will win today’s match? In Today Dream11 Fantasy Cricket Prediction DD vs RR 32nd T20 Match IPL 2018, we will cover playing 11, pitch report of Feroz Shah Kotla, Delhi, toss prediction. We will give you all the details that will lead you to win any fantasy leagues like dream11 and myteam11. The details will include players recent and past performance, weather report of Delhi, Dream11 guru prediction, all the latest news and updates of RR vs DD match, key players, the best choice for captain and vice-captain. We will also give you dream11 best team, where you can watch the live match of Delhi Daredevils vs Rajasthan Royals and details of live streaming. All the details are absolutely FREE. Make sure to read the complete post to get 100% benefits. It takes hours to gather these data so we can expect from you that you at least spend five minutes on this post. You have always noticed, you missed the grand league just because of one player. This happens because you haven’t read the complete post. There is a slight difference between a loser and a winner. Where you want to at the end of today’s match. Where Can You Watch the Live Streaming of RR vs DD or Channels to Watch? Who Will Win the 32nd Match of IPL 2018 Between DD vs RR and Toss Prediction? What is the best combination of players for Dream11 in 32nd Match? Date: The match will be played on 2nd May 2018 (Wednesday). 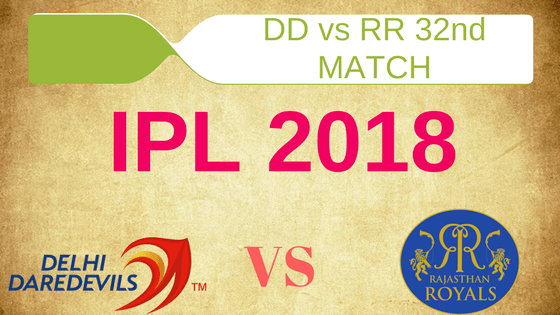 Match: Indian Premier League, RR vs DD, IPL 2018. At Delhi, Feroz Shah Kotla, two matches were played in this IPL. The last game played here was 200+ score and previous to that was a low scoring game. Both day the pitch behaved differently. Today the pitch is expected to be flat and batting friendly. It is predicted that it will favour the batsmen more as compared to bowlers. Note: Having an idea of the pitch before the match helps to select a perfect team for any fantasy leagues. On Wednesday, the sky will be clear and it will be a sunny day. The cricket fans can enjoy the full game as there is no sign of rain. The temperature is expected to be 36-Degree Celsius and the humidity to be 31% which may rise up to 49%. Note: If you know the weather report before the match then you can make or adjust your team accordingly as weather plays an important role in any match. There is a good news for RR fans and bad news for DD fans. In last five games, Rajasthan Royals have won all the matches against Delhi Daredevils. If we look at overall encounters, DD has won 6 times and RR have won 11 times. At this venue, both the teams have equal wins. It will be interesting to see which team wins today and improves their record. Rishabh Pant (wk), Shreyas Iyer (c), Vijay Shankar, Prithvi Shaw, Colin Munro, Junior Dala, Glenn Maxwell, Amit Mishra, Rahul Tewatia, Jason Roy, Liam Plunkett, Gurkeerat Singh Mann, Avesh Khan, Manjot Kalra, Jayant Yadav, Trent Boult, Gautam Gambhir, Shahbaz Nadeem, Abhishek Sharma, Daniel Christian, Sandeep Lamichhane, Mohammed Shami, Sayan Ghosh, Harshal Patel, Naman Ojha. Rahul Tripathi, Ajinkya Rahane (c), Sanju Samson, Prashant Chopra, Jos Buttler (wk), D Arcy Short, Jatin Saxena, Ben Stokes, Jofra Archer, Mahipal Lomror, Heinrich Klaasen, Ish Sodhi, Krishnappa Gowtham, Aryaman Birla, Shreyas Gopal, Dhawal Kulkarni, Ankit Sharma, Jaydev Unadkat, Anureet Singh, Ben Laughlin, Dushmantha Chameera, Stuart Binny, Sudhesan Midhun. Both the teams have lost their last game while chasing. The match was close but they failed to chase. The big concern for both the teams is their foreign players are not performing up to their potential. The big names from both the teams have to perform if they want to go to playoffs. It will be interesting to see how both the teams make adjustments to their teams. Rajasthan Royals surprised everyone by dropping Shreyas Gopal. Gopal has performed well in this Season of IPL. If Rahane make any changes, he will bring Shreyas Gopal in, in place of Mahipal Lomror. There are more chances that RR will play with same playing 11. Rahul Tripathi, Ajinkya Rahane (c), Jaydev Unadkat, Shreyas Gopal/Mahipal Lomror, Sanju Samson, Jofra Archer, Ben Stokes, Dhawal Kulkarni, Jos Buttler (wk), Ish Sodhi, K Gowtham. Delhi Daredevils played fairly well in last two matches. They won one and was very close to winning the next one. It is very unlikely that DD will change their playing 11 until and unless there is any serious fitness issue. Prithvi Shaw, Rishabh Pant (wk), Colin Munro, Glenn Maxwell, Shreyas Iyer (c), Trent Boult, Liam Plunkett, Vijay Shankar, Avesh Khan, Amit Mishra, Rahul Tewatia. Pro tips: Both the players are good but you can keep Rishabh Pant over Butler as he bats at the top and is in a good form. For Multiple teams make a combination of the above players. Pro tips: Ben Stokes has not performed much in this IPL but can strike on any day. You can keep him in the grand league. Make a combination of above players for multiple teams. Pro tips: As the match progresses, the pitch will become slow, so try to keep fast bowlers in your teams. For multiple teams make a combination of the above players. Pro tips: The above players are most likely to perform. You can keep them as captain and vice-captain. Make a combination of multiple teams. Pro tips: The above players have performed well in the previous matches. You can take them as a captain and vice-captain. RR has a better record against DD in all IPL’s but in last two matches, Delhi Daredevils have performed very well under the captaincy of Shreyas Iyer. According to cricket news websites and cricket experts, Rajasthan Royals will win but according to our astrology prediction, Delhi Daredevils will win today’s Match. The team winning the toss will love to bowl first but according to crix11 prediction, they should bat first as both the teams have lost their previous games while chasing. According to our astrology prediction, RR will win the toss and invite DD to bat first. If you look at the previous matches trend you can clearly see that Indian players are performing better than the foreigners, so keep more of Indian players. The pitch will favour both batsman and bowlers, try to make a combination of both the departments. Colin Munro could be a good option for the foreign players. Conclusion: This is it for Today’s Dream11 Fantasy Cricket Match Prediction of DD vs RR, 32nd T20 Match, IPL 2018 which will be played on Wednesday 2nd May. You can give your valuable feedback in the comment section. Subscribe to our notification of latest updates. GOODBYE! Hey OP Singh, try to make your own team. If we give more teams. Most of the readers will play with the same team and ultimately it will of no use.